What makes people believe in God? Who created God. Why we believe in God. What makes people believe in God? If we ask a thousand people the question, we get a thousand different answers. But when we look at the distribution of people holding various beliefs, the answer jumps out at us. Our God is the God of our parents. Around the world, this holds true. If you live in Tunisia, you are most likely Muslim. If you live in Ecuador, you probably are Catholic. Why? Your parents, their friends, neighbors, and community all hold Catholic beliefs, and this is what you grew up with. Being Catholic seems totally natural to you, and you wonder why all people aren’t Catholic. Questioning your faith would mean offending your parents, friends, loved ones, and maybe denying your country. Even though 99% of the world probably does not agree with your version of God, you won’t feel comfortable seriously questioning your faith. Growing up in this environment, you will be Catholic. Generation after generation remain Catholic, Muslim, Buddhist, Hindu, or whatever spirituality their forefathers practiced. But… there is so much to faith than family history. Being a very devout and proud Christian, I started out many years ago researching a book I wanted to write to show to the rest of the world the power and glory of my God. Being a expert at problem solving, I knew with some research I could prove to the world the truth about my God. I quickly discovered the truth: Everything I was taught and thought I knew about God was wrong. For over a decade I continued my research and in my book and on this website I have compiled the evidence and a complete explanation of why we believe in God. This website is devoted to exploring the religious experience. Whether you are a believer or not, religion is a big part of daily life and everyone should understand God and religion. It is a popular topic and is fun to study! The psychology behind why people embrace various religions is fascinating. The thousands of religions are a reflection of our very diverse human nature. When you understand why people believe, you will understand yourself, your friends, and your country better. And when you understand others, you can work with them better, tolerate their unreasonable logic, appreciate their perspective, and help them overcome their prejudices. The untold history of why men and women embraced religion reveals where God came from, and why so many still believe. Over the ages, the logic and science used to justify each person’s version of God has been honed into powerful arguments of faith. What makes an intelligent person still believe that God does exist? These topics are not discussed in polite society, banded from public school classrooms, and in many places are illegal to consider. Religion is such an important part of many people lives, it really should be taught everywhere. But “religious freedom” laws make it difficult to have an honest discussion about religious faith. There are so many historical, emotional, psychological, and logical reasons people embrace a God, it takes a lot of studying to understand why people believe. I’ve condensed it all into a book, and summarized it here on this website. Religious freedom is right here! This website and my book embrace religious freedom, free thinking, logic, knowledge, and compassion. 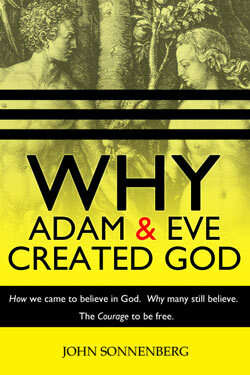 Why Adam and Eve Created God by J. Sonnenberg is the culmination of 15 years of research into this topic. It answers the big questions: Does God exist? Is there proof of God? Can we be moral without God? Here you can preview the book, read additional related material, and contribute to the topic. It is now a very hot topic. USA Today reports (Oct 9, 2012) that “nones” are the fasted growing segment of religion. Nones are those of us who proclaim to have no religious affiliation at all. I prefer to be called atheist instead of a nun:) It can be a difficult transition to go from believer to atheist, and I will help you with this transition. Once you start to understand how and why we created the gods, the emotional and intellectual freedom you begin to enjoy will startle you. You’ve probably been taught your whole life that atheists are evil, immoral, unhappy, cruel, foolish, lost souls. But you soon will find out the reverse is true, and the joy of religious freedom is very rewarding. If you do believe in God, take a moment now and think about your faith. Why do you believe in God? Think back on how you acquired your faith. Think about why you don’t change faiths. Don’t be ashamed, it is OK to ask this question. Take this opportunity to explore yourself and your religion in a very unique way. Your ties to religion are very strong, and you will need my book to help you overcome the emotional and intellectual struggles you face when questioning your faith in God. I wrote it for my children so they would have all the help they need to deal with being athiest in today’s world. I understand how emotionally difficult it is for a life-long believer to read a web page like this. And I truly want to help you discover the independence that true religious freedom brings. It will change your life. It’s probably not your own doing. There are so many reasons people believe in God, most all of which are completely understandable and normal. And none of which have anything to do with supernatural events, divine interventions, revelations from heaven, or the work of a deity. Look back on your life; have you ever seen any real proof that your God exists? No. Has any prayer really been answered? No. So why do people believe? You believe because your emotions, senses, feelings, hopes, misbeliefs, phobias, fears, and mortality make belief easier than not. Authority figures with charisma offering eternal life, protection from evil, and a packaged method for happiness will tell you how random events prove their God is real – without any proof. My book has 300 pages describing the hundreds of reasons people believe. I’ve researched and discussed every single reason people believe in God. So why do people believe? The answer has nothing to do with God. We know this because there are thousands of Gods and billions of believers. People simply want a God. And why is this? On the surface, the answer seems so simple – parents make their children believe in their God. Generation after generation continue the traditions and rarely do they stop and question their faith and ask Why Believe? Their mind says: Why Not? Their emotions say: I must. My book reveals all the reasons men and women embrace God and ignore the reasons to be free of religion. For most people, the reasons to believe outweigh the challenges of disbelief. No religion has anything supernatural. Once you read about them, you will see why Why outweighs Why Not for most people. And you will find it easy to toss your religion aside. 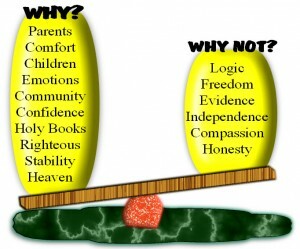 Why do people believe? It is a fascinating question, and looking back at mankind’s rich history of religious and outlandish beliefs can be quite entertaining. For some, it can be a bit painful. We are a species of believers ready to embrace ideas that meet our many needs. We have a lot of emotional and psychological needs that in some cases, only a religion can provide. Our beliefs are personal yet ingrained in our community, and are an integral part of who we are. This book uncovers the origins of religious beliefs and reveals why they perpetuate even today. It looks at the history of religious thought, and the evolution of various religious ideas. You will see why intelligent people will believe not just in Gods and the supernatural, but often believe in completely outrageous ideas. With history as a backdrop, this book delves into the wide array of emotional, social, intellectual, logical and psychological factors that made ancient people create God and still cause the majority of us to believe in some form of those gods. Popular religions with very contradictory ideas are found all around the globe, which show us that the actual teachings of a religion are not all that important. Ideas are not why people believe. All the other factors are. This book develops a clear picture of what religious belief really is, encouraging you to break down the barriers it places around your mind, your life, and your society. Along with this web site, there are many other books dedicated to proof there is no God. My book will show you why so many still believe without any proof that there is god. To those looking for proof that god exists, then this books may help. It does prove that God exists – in the minds of the believers. Another truth we politely ignore, is that belief in God is still growing. It is growing in the poorly-educated areas of the world were it is easy to make believers. In developed nations where higher-education is common, belief in God is diminishing quickly. It is rude to point-out that a huge part of any population is made up of not very-smart people, and these folks work, vote, teach, preach, and raise families. They pray to God with un-questioning faith because they don’t know any better. By reading this far, it proves you are smart enough to discern the flaws in your faith. You will soon feel the joy of religious freedom that modern educated people are experiencing. Why Adam and Eve Created God explains religion in a way that has never been done before. Belief in God is not abnormal, wrong, bad, stupid, illogical, or naive. Billions believe – it is quite normal. My book will show you the logic, reasoning, motives, and history of your faith. You will see there are many many reasons people believe. Once you understand them, the “light will come on“. That feeling of revelation is not unique to religion. You will feel released, renewed, and emotionally invigorated because you will see that you can leave your faith behind, live life, and discard many phobias you’ve accumulated. I hope we can help build a society that is inspired by love, not fear. One where people are encouraged to use clear-thinking intelligence when making judgments, to doubt bad ideas, to trust ourselves instead of a god, and to judge actions with regard to their effects. Our godless community can be far more harmonious than any religion has ever accomplished. It starts by understanding our own nature. Read on and see why we created God, why many still believe, and find the courage to be free. The reasons why. I’m an engineer and know that everything can be tested and studied. But there are many believers who will say God cannot be tested, verified, or scientifically dissected. They will say: Belief is a matter of faith. Fair enough. I give credit to anyone who will say this because at least they recognize that there is no logic, proof, or intelligent basis for their belief. They are smart enough to see the unreasonableness of religion, but they need no reason — they have faith. It feels right to them, and they have faith it is true. I wrote this book for the faithful believer also. Faith feels great, and good emotions come from many places within the human spirit – all of which are well known. The psychology, physiology, and social aspects of strong faith is fascinating to study. When you read my book, you will find out that these good emotions are very normal. You will find out how these emotions are easily manipulated. You will learn so much about human nature that you will understand why other people cling to a blind faith, and you will easily leave any faith in God behind you. The answer to the question Who Made God? is easily found by studying why we believe in God. When you understand why we believe in God, and where this belief came from, you will see who made your God. The reason people are one particular religion or another lies within their own personal history. When you study mankind’s history, you will see how people made their God, why they gave Him the traits they did, and why they still believe. Does God Exist? Yes – in people’s minds. Is there proof of God? Yes. Is there 100% proof there is no god? Yes. Read about how we made our Gods, and you will see the proof that we created god and He still resides in our minds. Experience True Religious Freedom. Learn how we came to believe in God, Why many continue to believe, and find the courage to be free.